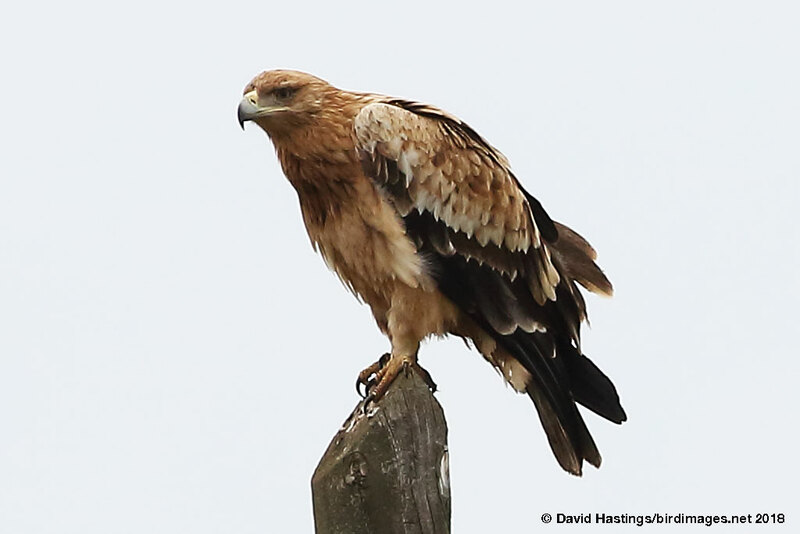 Spanish Imperial Eagle (Aquila adalberti. Juvenile. Taken in Extremadura, Spain, on November 16th 2018. Juvenile. Taken in Extremadura, Spain, on November 16th 2018. This is a large raptor and fairly large eagle, broadly similar in size to its close relative the Eastern Imperial Eagle. The adult has a broad distinctive white band on the shoulder and leading edge of the wing and a much paler tawny color on the nape and crown. The juvenile is very different from the adult, being a uniform pale straw-sandy colour, contrasting with broad black bands on both the upper and lower sides of the wings. It occurs in central and south-west Spain and adjacent areas of Portugal. Its stronghold is in the dehesa woodlands of central and south-west Spain, such as in Extremadura. Nesting habitat is usually dry, mature woodland, which is utilized for nesting and seclusion, but nests are most often fairly close to shrubby openings and wetland areas where prey is more likely to be concentrated. It normally only nests where human disturbance is quite low. The species is classified as Vulnerable by the IUCN.